The Work Party held on Saturday 6 December 2014 again focused on the site of the former Lock House, locating any foundations and removing demolition rubble mainly from the back garden and Living Room areas. We were pleased to welcome Elizabeth Thomson, C&RT's Heritage Adviser for the West Midlands. She was shown around the site and soon identified some stonework that could possibly have been lintels or window sills. Elizabeth will advise us generally and suggest best practice on how to conserve what we find - much appreciated. The foundation of the whole west wall of the Kitchen was uncovered. It seems that this wall may have had strengthening brick supports. However, it is still unclear where the north wall of the Washhouse branches off. The foundation of the whole of the dividing wall between the Living Room and the Kitchen & Pantry was uncovered. This wall was noticeably uneven, suggesting possibly that some subsidence had occurred. As yet, there was no indication where the door between the Kitchen and Living Room had been. However, it does look as though the Kitchen was at a lower level compared with the Living Room - and this was expected. Looking at the extent and type of the demolition rubble, it is likely that when the Lock House was demolished (with the Range still in place), the rubble was roughly scattered over the immediate area including the back garden. It would appear that the debris was just left, in a heap and there was minimal regard to levelling the material. The height of the hawthorn hedge would have made it less likely that the debris from the House would have been transferred to the Basin - in fact Olive Price believes that when her parents moved into the House in 1929 the Basin had already been filled in and was overgrown with weeds, there was just a depression in the ground. Before relocating the debris, it was roughly separated into two categories: definite rubble (of little perceived interest or use), and rubble that could either be used again or which appeared to have had a specific purpose or looked interesting (such as whole bricks or tiles). Some of the rubble in the Living Room area seemed to consist of square-shaped panels of bricks, as though sections of wall (?) had remained together after demolition. Some stonework (possibly lintels or parts of window sills) were also found here, as were a couple of brown glazed ceramic earthenware (?) pieces. Another part of the cast iron Range was found in the debris of the back garden. 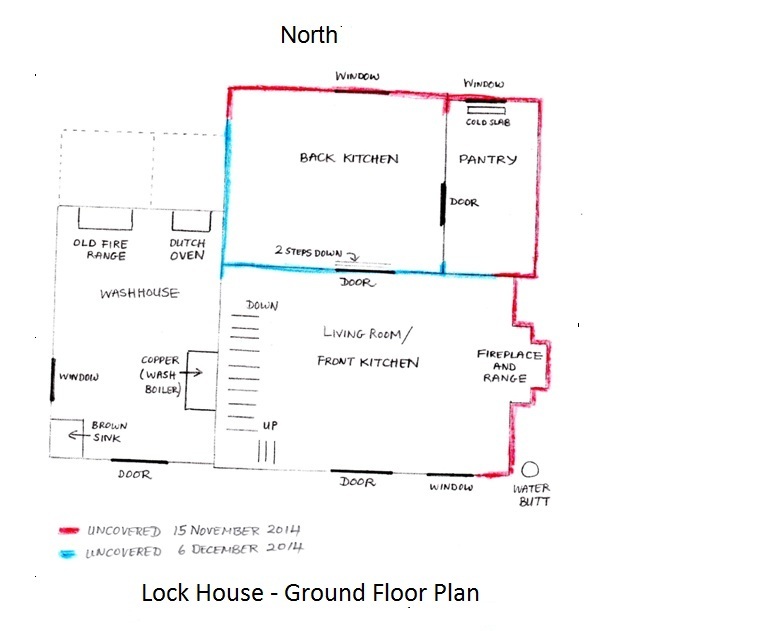 Since the last Work Party, Olive Price has confirmed that the Range in the Lock House was the same model as the Range that Yvonne Plant and Geoff Hales have in their home. How coincidental is that? Everyone who took part in this Work Party was thanked for contributing to the success of the day: Barbara Cooper, Norman Cooper, Geoff Hales, Ivor Hind, David Jones, Peter Moore, Yvonne Plant, John Potter (Work Party Coordinator), Vee Potter, Alistair Proffitt and Elizabeth Thomson (C&RT Heritage Adviser). Part of East Wall is in the foreground. In the centre, looking west along the dividing wall between the Living Room (left) and Pantry & Kitchen (right), terminating at the SW corner of the Kitchen. A closer view of the SW corner wall of the Kitchen looking west along the dividing wall between the Living Room (left) and Kitchen (right). The West Wall of the Kitchen is now in view at the end. A close up view of the SW corner wall of the Kitchen: the South Wall of Kitchen is in foreground and West Wall of Kitchen is towards the top right. Part of the West Wall of the Kitchen looking north, with SW corner of the Kitchen in the foreground. Looking east along the dividing wall between the Living Room (right) and Kitchen & Pantry (left), and terminating at the East Wall of the House. Part of West Wall of the Kitchen looking back to the SW corner of the Kitchen. The significance of the arrangement of red bricks is still the subject of discussion. A closer view of the red bricks of the West Wall of the Kitchen, this time looking north.